Dried tart cherries are a great source of antioxidants. They've been known to reduce muscle soreness, and fight heart disease and can even help you sleep better at night as they contain melatonin. I try to eat them on a regular basis either mixed in my oatmeal or in granola. Granola bars are so versatile. You can use the same base recipe, switch up a few key ingredients and have a completely different bar. This particular recipe combines pecans and dark tart cherries...two of my favorite things. 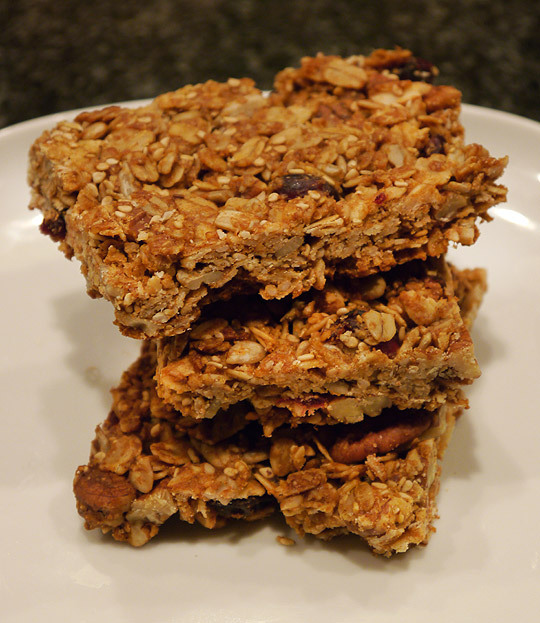 These bars are a delicious, easy to make on the go snack..that fit well in your brown bag. In a large bowl stir together oats, cherries, wheat germ, salt, seeds, cinnamon and pecans. In another bowl whisk together honey, oil, nut butter and vanilla..
Add the liquid mixture to the oats mixture and stir until evenly coated. Firmly press mixture into an 8X8 pan that has been lined with foil ans sprayed with cooking spray. Bake in preheated oven for 30-40 minutes or until browned at the edges but still slightly soft at the center. Let cool completely in pan on a wire rack. Using the foil lift the mixture from the pan and transfer to a cutting board. Peel off foil and cut into 15 bars. I can't tell you how much I love dried tart cherries. These granola bars sound great! I love dried (and fresh) cherries!! Yum. These look just like a version Kashi makes that I love. Except I bet yours are way better and certainly cheaper to make! My hubby eats cherries before bed to help him sleep :) They are so good for you! I'll have to make these for him. Perfect to pack for when we go to the beach! I love dried cherries in baking! Your bars look like such sweet treats!